These works, formerly belonging to Ralph Wood, were for many years - from about 1828 to 1859 - carried on by Samuel Alcock & Co., by whom they were rebuilt and enlarged in 1839, their rearranged manufactory comprising the works of J. & R. Riley (working period 1802-28), John Robinson & Sons, and William Taylor, which were all taken down for the purpose. 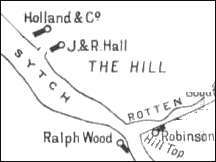 The Hill Top Pottery was at the top of a hill called "The Sytch"
1802 1828 J & R Riley The works were used by J & R Riley (working period 1802-28), John Robinson & Sons and William Taylor. 1828 1859 Samuel Alcock & Co Alcock rebuilt & enlarged the works in 1839 - The Hill Pottery of 1839 was designed by Thomas Stanley, a Shelton architect, who also designed St.John's Church and school in Goldenhill and St. Thomas's church in Mow Cop. 1860 1863 Sir James Duke & Nephews In 1860, the works and general estate were purchased by Sir James Duke and Nephews and continued by them until 1863, when they sold it to Thomas Ford. Sir James Duke & Nephews produced white & cream coloured earthenware services, china and Etruscan ware. 1864 1867 Earthenware and Porcelain Company under the management of Richard Daniel (once a noted china manufacturer at Stoke, Hanley & Burslem) it was carried on under the style of the Hill Pottery Company Ltd., late S. Alcock & Co. In 1867 the Hill Pottery Co was put into liquidation and the property once again came into the hands of Thomas Ford. 1867 Thomas Ford In 1867 the works were divided into china and earthenware. 1867 1899 Burgess & Leigh In 1867 Burgess and Leigh took the earthenware department and then in 1899 the moved to a newly built factory at Middleport - The Middleport Pottery. Edwin James Drew Bodley worked part of Samuel Alcock's Old Hill Pottery at Burslem which had been divided into a china and a separate earthenware factory in 1867. The china works (now called Crown Works in 1882) were taken first by Bodley & Diggory and then by Bodley & Son until Edwin J.D. Bodley began to trade under his own name from June 25, 1875. 1867 1870 Alcock, Diggory & Co On the division of the Hill Pottery Company manufactory in 1867, part was carried on by Alcock, Diggory & Co.
1871 1874 Edward F Bodley Mr Diggory having retired in 1871. 1874 1875 Bodley & Son Edwin F Bodley served as Mayor of Hanley in 1872-3. He retired and his son Edwin James Drew Bodley carried on. 1875 1892 Edwin J D Bodley From 1875 to October 31, 1888, he had William Telford as a partner, but this is not reflected in the trade style E.J.D. Bodley. In 1892 Edwin James Drew Bodley was declared bankrupt. 1895 1897 Messrs. A Heath & Co. The productions of Alcock & Co. were porcelain, Parian, and the finer descriptions of earthenware -one of their specialities being semi-porcelain of fine and durable quality. The marks include: ALCOCK & Co. or S. ALCOCK & Co. HILL POTTERY BURSLEM either printed along with the name of the pattern, or some device, or impressed in the ware. In 1860, the works and general estate were purchased by Sir James Duke and Nephews and continued by them until 1863, when they sold it to Thomas Ford, who in 1864 sold it to the Earthenware and Porcelain Company, by whom (under the management of Richard Daniel, once a noted china manufacturer at Stoke, Hanley and Burslem) it was carried on under the style of the Hill Pottery Company, Limited, late S. Alcock & Co. The productions of Sir James Duke and Nephews were earthenware services, both white and cream-coloured, and china and Etruscan ware... The operations of the Hill Pottery Company were of short duration, for in 1867 it was put into liquidation and sold up, when the property again came into the hands of Thomas Ford. In the same year, the works were divided - the china department being taken by Alcock & Diggory and the earthenware part by Burgess & Leigh (late S. Alcock & Co.), who manufactured the ordinary as well as the higher and more artistic classes of earthenware goods, both for the home and foreign markets. The firm produced all the usual services, and useful as well as many highly ornamental articles. The mark used by the firm was a beehive on a stand, with bees, a rose-bush on either side, and a ribbon bearing the name of the pattern ('Kensington', for instance) beneath, and under this the initials of the firm, B.L. & Co.
Messrs. Burgess, Leigh & Co. worked the Hill Pottery to 1899 and then this firm continued at the Middleport Pottery, Burslem. 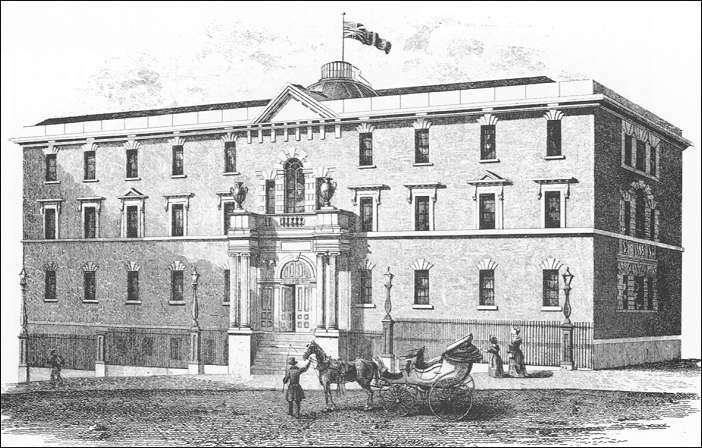 On the division of the Hill Pottery Company manufactory in 1867, part was carried on by Alcock, Diggory & Co. In 1870, the firm became Bodley & Diggory; but in the following year, Mr. Diggory having retired, the manufactory was continued by Edward F. Bodley. E. J. D. Bodley continued to 1892. Messrs. A. Heath & Co. were at the Hill Pottery from 1895 to 1897."